Creating a referral network doesn’t happen on its own, so fostering referrals should be an integral part of your business marketing and operations strategies. When you consider that physical therapy in the United States is a 30 billion dollar industry, it’s clear that there are opportunities for private practice clinic owners to increase revenue. One of the most common methods is through the active generation of referrals. Referrals can come from numerous sources, such as surgeons, physicians and physicians’ assistants, non-competing physical therapists and clinics, current and past clients, and local schools. 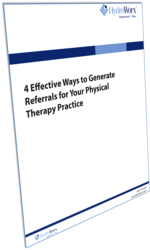 Of course, it takes a planned approach to enjoy a continuous, reliable and quantiable stream of referrals for your physical therapy practice. Download your free copy of this tip sheet by filling out the form to the right! Download Our Tip Sheet Today!